President Duterte confirmed reports that he went to the hospital Wednesday. 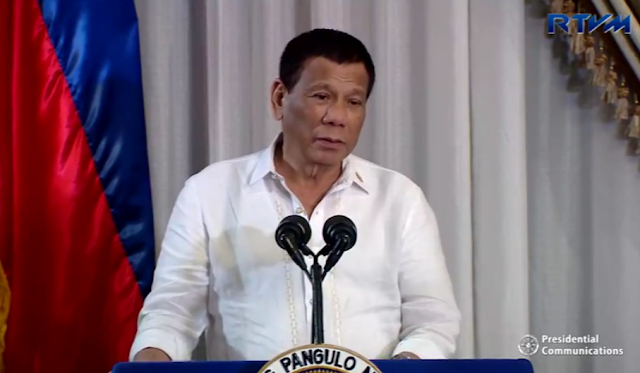 In a speech before alumni of the Philippine Military Academy (PMA), Duterte relayed the events before his most recent check-up. “Three weeks ago I had my endoscopy and colonoscopy. Then I was about to have Cabinet meeting yesterday,” he said Thursday evening. “But ‘yung reading ng aking (of my results)… somebody advised my doctor just also to repeat and get some samples there. So I stayed there for one hour sa (in) Cardinal Santos,” he added. According to Duterte, he is yet to find out what really is the status of his health. “So, hindi ko pa masabi kung meron ba talaga akong tama o wala (I can’t say if there is really something wrong with me or none). But I have this Barrett’s and it has been bothering me since, ever since dahil nga sa inom rin (because of drinking),” he said. “Pinapabayaan ko kasi ano… hindi ako naghinto ng pag-inom eh. Kaya nga wala na, pagsisisi ganoon na lang eh (I ignored it and didn’t stop drinking. That’s why I have this regret). It always comes late. So it got worse,” he added. But whatever the result may be, Duterte said that he will be sure to inform the public about it so as to avoid prolonging his agony. “I don’t know where I’m now physically but I have to wait for that. But I will tell you if it’s cancer, it’s cancer,” he said. “If it’s third stage, no more treatment. I will not prolong the agony in this office or anywhere,” he added. In a text message, Executive Secretary Salvador Medialdea confirmed that Duterte underwent another colonoscopy on Wednesday as outpatient. Talks about Duterte’s health surfaced anew after his absence to an event in Malacañang Wednesday. Earlier, both Roque and Special Assistant to the President Bong Go insisted that Duterte is healthy. Go, on the other hand, even said he will put at stake his life to prove that Duterte is in tip-top shape. “Walang katotohanan na-admit PRRD. Hindi ‘yan totoo, 100 percent po (There’s no truth that President Duterte was admitted. That is 100 percent false),” Go said. “Itataya ko ang buhay ko diyan, hindi totoo ‘yan. Antay lang natin mamaya may public appearance siya (I will put my life at stake that that’s not true. Let’s just wait for his public appearance), he added. Duterte’s health has been a topic always raised by his critics. Last week, Duterte mentioned that he had an endoscopy and colonoscopy. Malacañang, however, said that Duterte’s check-ups are just part of routine to ensure that the President is healthy.